The iPad has a bigger battery than an iPhone, giving you more time to work and play between charges. But this advantage comes with a price. Charging the iPad will take longer than charging the smaller iPhone. But the iPad charging block lets you charge your iPad faster. Here's what you need to know. 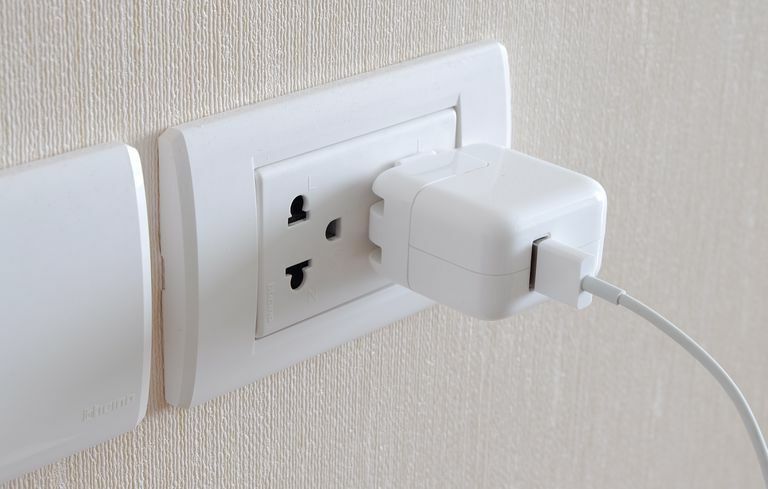 The iPad comes with its own USB power adapter, also called a charging block, which connects to your device with a lightning cable. This charging block is larger than the cube that comes with the iPhone, and this larger size translates into more watts, and a faster charge. Turn your charging block over to see the number of watts on your brick. Depending on your iPad model, your charging block is either a 5W, 10W, 12W, or 18W power adapter. The higher the number, the faster the charge. You will not damage your iPad by using a higher-wattage adapter. Apple uses lithium-ion batteries for its products, which only pulls as much current as the device can handle. You can keep your iPad plugged in after it is fully charged without damaging your battery. You can purchase a higher wattage charging block from Apple, to cut the time it takes to charge your iPad. The higher the number of watts, the faster the charge. Fast charging is a method Apple developed to give users a quick way to recharge their iPad or iPhone. A fast charge brings your battery level back up to 50 percent in just 30 minutes. This quick charging method will only work on an iPad Pro 12.9-inch (1st generation and later), or iPad Pro 10.5-inch or an iPhone 8 or later. All you have to do is plug the USB-C lightning cable to your iPad and to the charging block, and wait. Depending on the device you're using, in half an hour, you could have 50% of your battery life back. In addition to using the largest wattage charging block, there are other tweaks you can do to help you charge your iPad faster. The key is to give the battery a chance to rest so that it can focus on one thing — charging, instead of simultaneously draining the battery using other applications. Turn off your iPad for a quicker charge. While it's perfectly fine to use your iPad while it's charging, any energy the iPad is using to light the screen is taking away from some of the power you're trying to build. Turn off your iPad, walk away, and let it charge. Put your iPad in Airplane Mode to charge faster. If you must use your iPad while charging, try to at least put your iPad into airplane mode, if you do not need internet connectivity. Airplane mode helps to save battery by cutting off your iPad's connection to Wi-Fi and cellular networks. You will not have access to Bluetooth, location services, or any other activity that requires an internet connection. You can access airplane mode on the home screen by swiping up, or down to see the Control Center. Tap on the airplane icon. The iPad goes into Airplane mode and an airplane icon then appears on the screen status bar. Turn down your screen brightness. Your screen brightness is probably your biggest battery drain. Shift it down to the minimum brightness so that you can still read the screen, but low enough to conserve battery. Go to Settings > Display & Brightness to dim the brightness. Close any apps you aren't using. Swipe any apps that are running in the background to close them. Disable Background App Refresh. You may not need your apps to continually refresh their content while you're not using them, which can drain your battery life. To turn background refresh off, go to Settings > General > Background App Refresh and select which apps you'd like to stop refreshing in the background. Disable Location Services on apps. Find out which apps are using location services by going to Settings > Privacy > Location Services. Turn off any apps that are requesting location. Turn off notifications. Notifications come intermittently from other apps that are not even open, which consumes battery power. Go to Settings > Notifications and select the apps that you would like to disable notifications. Turn off Bluetooth & Handoff. In addition to turning off Bluetooth, disable Handoff by doing to Settings > General > Handoff and toggle off the feature.